Welcome to you in the Activity Book of the Electrical Motor Winding. This CAI Material is part of the Technopreneurial Course Package. It is of different kind as compared to that of the conventional packages. This is well suited for the beginners’ those who wish to do career in the area of service sector and even in Multi-service Community Information Centers. After going through this package, you will acquire the skills of testing, repairing and maintaining Electrical Motors. 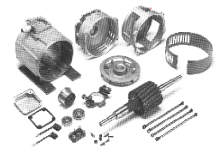 This CAI package covers all basic and advanced aspects of the Electrical Motor Winding. It gives theoretical as well as the practical details and also information about standard operating instructions. This CAI package gives you details regarding tools, instruments, “Winding and Insulating materials”, “Winding diagrams and Procedure” and all other related aspects. This will help you to understand better about servicing and repairing of the Electrical Motors. The contents of this CAI package are arranged in the number of multimedia activities and Units. The widespread use of the Electrical Motors in rural and even urban area is generating keen interest in the basic concepts and applications. This Technopreneurial Course CAI package provides in-depth knowledge about all these aspects. This CAI package is self-explanatory on several levels. You will quickly begin creating applications by following simple examples. Once you become familiar with the technical processes, you will be able to service the all types of Electrical Motors. Demonstrations, Visuals, practical exercises, Practical briefs, and standard-operating instructions will be useful to you. Lets know more about all these. Are you tempted to go ahead? Dear friends, you will also get additional latest update about such Technopreneurial Course CAI package and contents on the web site. I also direct you to browse the same URL (Uniform Resource Locator) to comply with the additional skills that you require. Stay ahead to tune with advance knowledge to compete in the market.